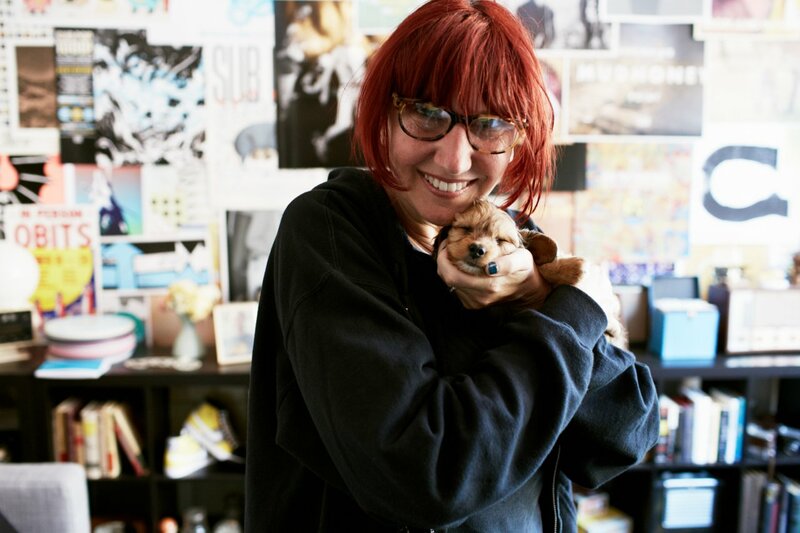 Sub Pop Records founder Megan Jasper swears like a sailor but is as sweet as can be. Giving her company bio a read before getting together with her, we had a feeling she’d be a total hoot—take a quick look yourself. Jokes aside, this former punk rocker has put in a great deal of time and hard work to rise through the ranks at the label, which is now celebrating it’s 25th anniversary. “I’ve lied a couple of times, but I won’t lie to you guys,” she told us with a laugh. She was referring to a New York Times piece that she was quoted for, where she gave the reporter a false list of grunge lexicon, and definitions for her fabricated words. He completely fell for it. “I had my mohawk when I was either fifteen or sixteen, which required so much hairspray,” she told us, “My parents were mortified. They’d make me walk 20 feet behind them in the grocery store.” At the the time, she was sporting that mohawk along with combat boots, homemade studded jewelry and men’s button-down shirts with band names and lyrics stenciled on the back. “I was crusty,” she said. “I thought I was going to be a school teacher, and working with music was just me procrastinating being in a classroom,” she told us. After finishing school, she took off on tour with Dinosaur Junior, knowing she wanted to leave the East Coast. Touring would give her the opportunity to feel out each city and determine which may be the best fit. As part of the 25th anniversary celebration, Sub Pop has reopened their Mega Mart in Seattle’s Georgetown neighborhood. It’s a one-stop-shop for Sub Pop fans: it carries a collection of records and memorabilia, much of which can only be purchased in the pop-up shop. As the weeks go by, they’ll be snapping polaroids of any well-known visitors. If you’re in town, we highly suggest taking a seat in the front hang out space to see who stops in—we checked out the polaroids taken when their last Mega Mart was open, and spotted folks like Beck. You may even get to meet Megan herself!